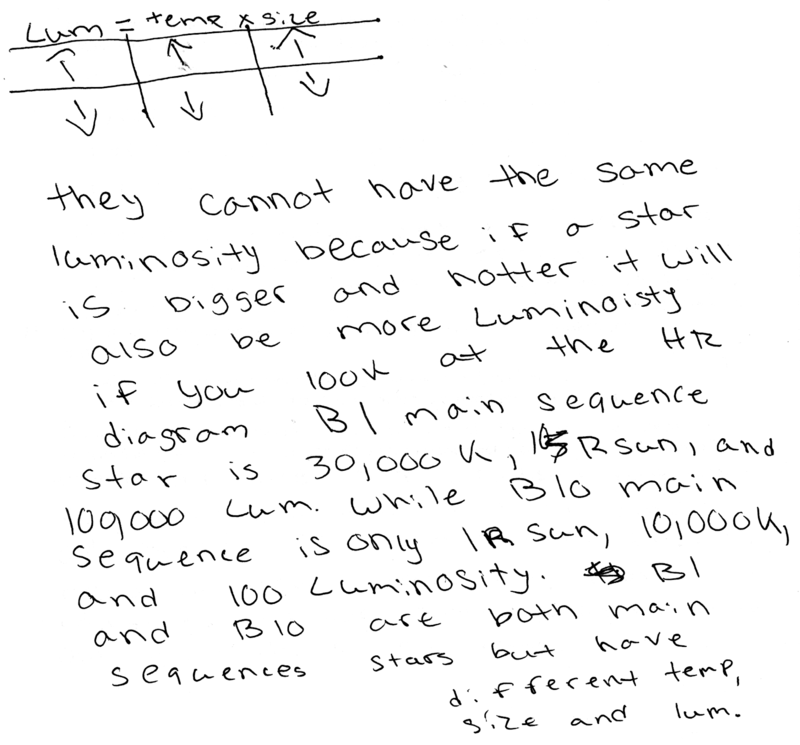 NiH: Can a large size main-sequence star have a hotter temperature and brighter luminosity than a smaller size main-sequence star? Bes: Yes, it could be possible that a large size main-sequence star can have a hotter temperature and brighter luminosity in comparison to a smaller size main-sequence star that has a cooler temperature and dimmer luminosity. Correct. 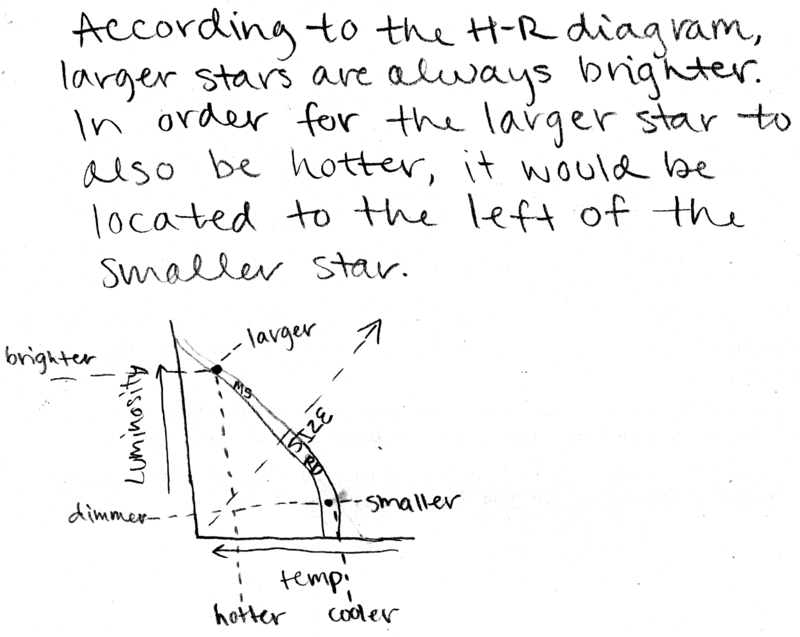 Discusses how the Stefan-Boltzmann law and/or H-R diagram shows that along the main-sequence, the larger stars will be located in the hotter, brighter upper left-hand corner, while the smaller stars will be located in the cooler, dimmer lower right-hand corner. 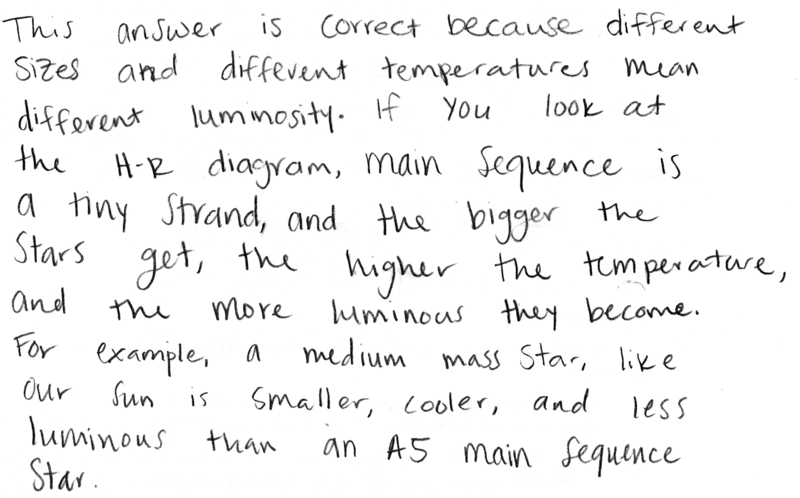 Astronomy final exam question: type II supernovae in star cluster with white dwarfs? Pdg: Can there be type II supernovae explosions seen in a star cluster that also has white dwarfs at the same time? Would it have to be a really old or young star cluster? spota: Yes, if the star cluster is old enough to contain white dwarf stars it will still be young enough to have hydrogen-burning massive stars that can undergo type II supernova explosions. Discuss why this answer is incorrect, and how you know this. 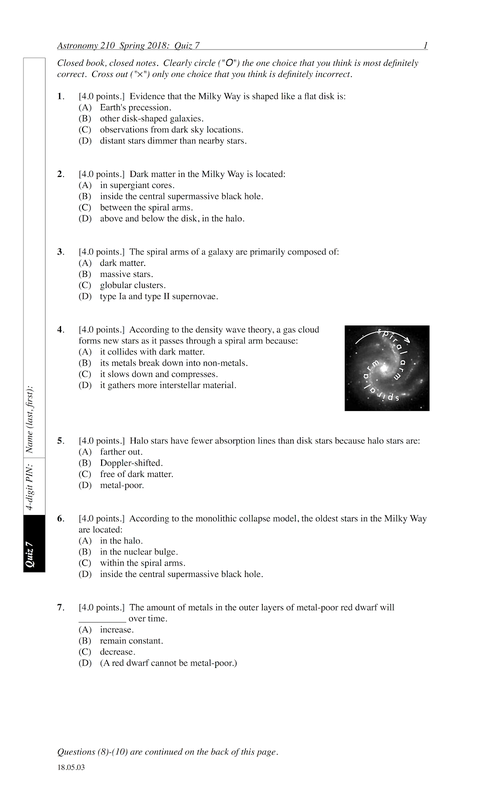 Explain using the properties of mass and stellar lifetimes, evolution of stars, and star cluster ages. a star cluster with white dwarfs, will not have any supergiants remaining that can explode as type II supernovae; or a star cluster with supergiants exploding as type II supernovae will have medium-mass stars that have not yet reached the end of their main-sequence lifetimes. Limited relevant discussion of supporting evidence of at least some merit, but in an inconsistent or unclear manner. Garbled discussion of properties and evolution of stars. May discuss type Ia supernovae or lookback time. Implementation/application of ideas, but credit given for effort rather than merit. Discussion other than that of the properties and evolution of stars. Astronomy final exam question: metals breaking down in stars? Alexis: Why are metals more abundant in newer stars than older stars? tdloo: Because the metals haven't had time to break apart yet in newer stars. Discuss why this answer is incorrect, and how you know this. 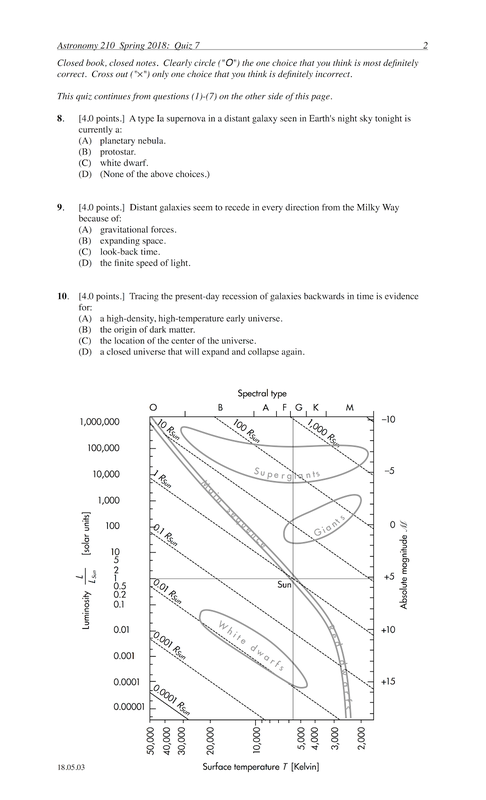 Explain using the properties of mass and stellar lifetimes, and evolution of stars. metals are typically produced in the cores of previous generation ("old") massive stars, which explode as type II supernovae to scatter these metals that get incorporated into the next generation of "new" stars, such that metals are more abundant in newer stars than older stars. Limited relevant discussion of supporting evidence of at least some merit, but in an inconsistent or unclear manner. Garbled discussion of properties and evolution of stars, such as breaking down of metals; masses and evolution rates. "Do your readings and show up everyday to class because it helps so much more than thinking you can just read the book and be good." "Show up to class and study for every quiz, it takes a lot of the stress out of the class and makes it very enjoyable." "Be curious and ask questions." "Don't forget that the quizzes are due before each class at midnight! And if you're taking astronomy lab, too, it's easy to forget about those assignments as well." "Make sure you use the starwheel the right way, read the chapters, study your notes and do EVERY online reading asssignment." "ASK QUESTIONS AND PUT IN EFFORT! This class is so engaging. You'll learn so much. Do your homework, and come to class. It is all worth it. If you put the effort in you will pass this class easily. P-dog is the best." "Study StUdY STUDY! Get a group of people from your class and study for all quizzes/exams/midterms, anything! It will help you out a lot and don't slack off." "Always do the homework assignments, they are super-easy and pay attention in class. This is a great course and you will have a lot of fun." "In order to succeed in this course you need to do the readings, and the homework is important and reviewing the presentations." "DO THE READING ASSIGNMENTS. ATTEND EVERY LECTURE. BE AMAZED BY SPACE." "In order to succeed in this class I urge everyone to look at the quiz study guides and make sure to do the online reading assignments." "Don't procrastinate, go to class, and do the readings! They help immensely with following along in class." "In order to succeed, I would recommend that you go to all the class sessions, do not forget a single online reading assignment, do all of the extra credit, and try your best not to procrastinate!" "Preview then presentation slides online so you can be the more confident while being in class or with in-class activities." "Read the chapter before class and keep your quizzes." "If one is going to be enrolled in astronomy with Dr. Len, the most important thing to know in order to succeed is to follow @Patrick_M_Len on Twitter. He also posts everything on blogs, from former test questions with correct answers, along with the reading assignments and basically everything related to the course. And being aware of the blogs and what is posted there might help. 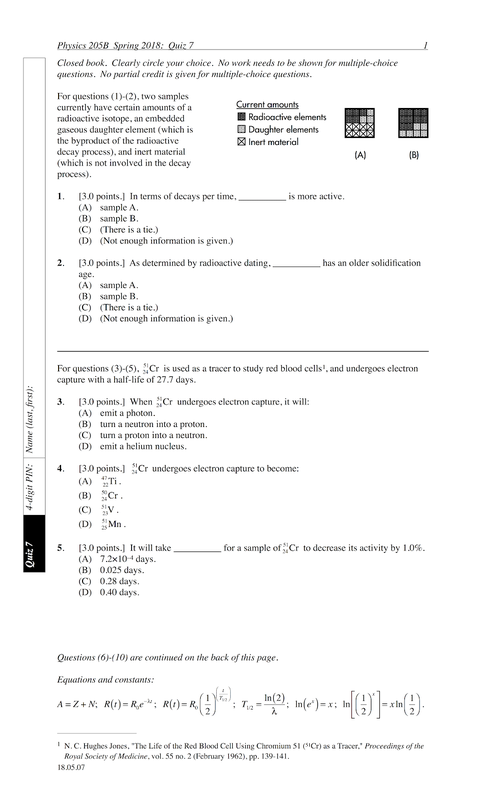 Former midterm questions are good study guides and Dr. Len shows examples of students answers and grading rubric really shows how he grades and what he looks for." "Please please PLEASE do the reading assignments and come to class." "They need to be able to show up to class to get the points that are handed out. It really isn't that hard yet to just do the work that is asked of you." "Study and listen during lectures." "Read, read, read, and study...by reading." "Don't get behind on the reading and ask a lot of questions." "Keep up with reading, get as many points as possible." "Come to class, do your reading, study for quizzes!" "Take lots and lots of notes and seriously read the book. Plus make sure you draw the drawings P-dog does in class, they help." The amount of metals in the outer layers of metal-poor red dwarf will __________ over time. Medium-mass and massive stars produce metals (elements heavier than hydrogen and helium) in their cores during their giant/supergiant phases, up through type Ia/II supernovae explosions. Along with their unused hydrogen, these metals are then scattered into the interstellar medium, which are then incorporated into later generations of stars. However, a red dwarf (low-mass star) will only be able to fuse hydrogen to helium, and does not produce more metals. "The age of this world; I think that it's interesting Earth has been through many stages." "That chemical evolution is not considered being alive even though it should be. It is creating something or changing something which makes it seem alive." "Your pictures are cool because it helps me to visualize what we are learning about and I like that." 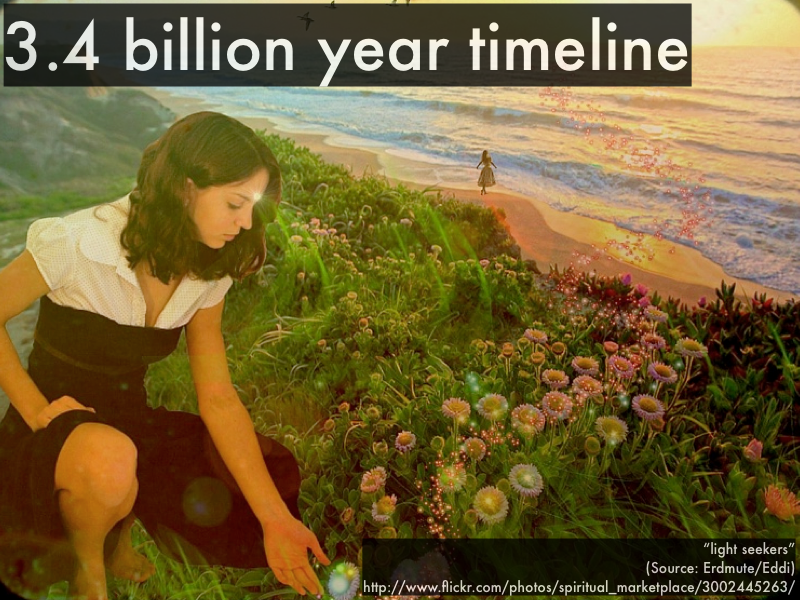 "The timeline of Earth, and when life starting appearing, because it is really mind-blowing to see it on a timeline." "Learning about carbon molecule chains was really interesting. The fact that all the information needed to survive and reproduce is stored on those simple chains is sort of mind-boggling." "Possible life on other planets because I believe it's kinda scary." "Origin of life on Earth. Its interesting because it has brought much debate from the science and religious societies." "The definition of life is interesting. Thinking about life in the way that it does versus what it is." "I find the history of life on Earth very interesting and the fact that we are such a small part of our history as a planet, yet we will probably be the ones to destroy it, very sad." "I'm super-interested in the idea of intelligent life throughout our universe, such as traveling between the stars, it's crazy that the fastest human device launched will take about 90,000 years to travel to the nearest star." "There is an equation for finding the number of communicative civilizations in our galaxy." "I really enjoyed learning about the Drake equation because though there is no way of using it currently, it is interesting to hear that there is an active search of other advanced life and that it is thought of as a serious possibility." "I definitely thought that the Drake equation was very interesting. I did not know that it was possible to even form such an equation, yet here it is! I love it." "I've always found extraterrestrial life interesting and think that it would completely change our lives and culture if we actually were able to converse or communicate with what's out there." "That this is our last lecture." "I don't understand the timeline you inserted. Like why? What does it mean?" 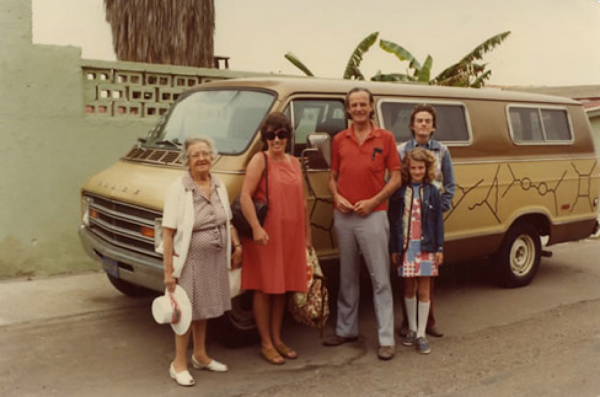 "I didn't really understand the process in which Julia Child went through to describe the how life on Earth begun." "I am so CONFUSED of how we haven't been around for that long." "Traveling between stars because of how long it seems to take to get to each one." "Carbon molecule chains. 'In order to do things that livings things do, and more importantly, to make sure that a future generation is able to continue doing these things requires a lot of instructions to be stored.' MIND BLOWN." "I was confused on the chemical evolution portion of this assignment. I thought it was really hard to grasp the idea of things naturally joining together in the fact of adapting to certain area's around Earth. Thus, evolution." "How the chemistry works with molecules, this is confusing because I need it to be explained since for me chemistry is hard." "The Drake equation was really confusing for me. I don't know how exactly all those variables are expressed or how they constrain the probability of life in a real sense." "As usual, the thing I find the most interesting is the same thing that confuses me the most. I do not know what makes up the Drake equation, or how someone even came up with it." "Living things breathe and can reproduce, while non-living things cannot." "Living things are organisms that are made up of atoms and cells that allow life to move and talk and feel. Inanimate and non-living objects cannot do this." "A living thing has to be able to adapt in the environment but dose not have to if it is non-living." "Living things can adapt themselves and their surroundings to accommodate survival, non-living things may last for centuries, but could eventually fade away." "Life is the ability for cells to grow, develop, manipulate its environment, and have future generations while non-living things have no live cells." "Living things can evolve and adapt whereas non-living things cannot. One way to tell whether or not something is non-living is to play the song 'Hey Ya!' by OutKast. If the thing does not dance or sing along to the song, it is non-living." "Living things are alive, non-living things are not." "I feel like Earth is the only place where people can actually survive. It would interesting to know what new discoveries scientists would make but it's not like it would benefit me in anyway. You know what I mean." "I just want to verify that there are other living organisms in the universe, even if this is as simple as a single-celled organism. Only because that organism can evolve just like we did." "Because it'd be cool to know of other life forms and see how they live and see if their lifestyle is better than ours." "Life elsewhere scares me. You don't know if they're gonna be friendly or not." "I think that there's no way that we are the only living things in this universe, or anywhere other than Earth. It's interesting to think about what it may be, it's (probably) not little green aliens in a flying saucer, but who knows?" "I think it is important because I don't think that we are alone. Knowing if there is life on other planets could help us answer a lot of questions that we have about our galaxy and may help us with things we are trying to research and fix." "Other life forms could possibly inform us about how our universe was created, or how life itself has turned into what we know today. finding other organisms would be a huge development in human existence." "Knowing that there is life elsewhere doesn't change my daily life here." "I struggled between selecting 'somewhat important' and 'important.' I think that life elsewhere could potentially help but I'm not sure to what extent." "We are wired for discovery and the fascination of being able to prove life elsewhere is something humans will strive to learn." "My own personal reason would be existence and the meaning of it. I sometimes go down the rabbit hole of intense thought surrounding this. If we found out that there was life elsewhere I believe it would provide some comfort to me knowing that we aren't in this alone. Not necessarily that there's a purpose to all this but it might create more meaning to our own existence." "There is no way that we are the only living beings in the universe. I want to know what else is out there." "Although not totally unimportant, right now it does not affect the way I live." "It would be very important to know if there was life on other planets or further in the universe. This mostly is because of the natural feeling we get as humans wanting to know more and more in life and where people and living being exist at." "I love aliens, I love X-Files, and everyone needs to know that life beyond Earth life is important and cool and amazing. 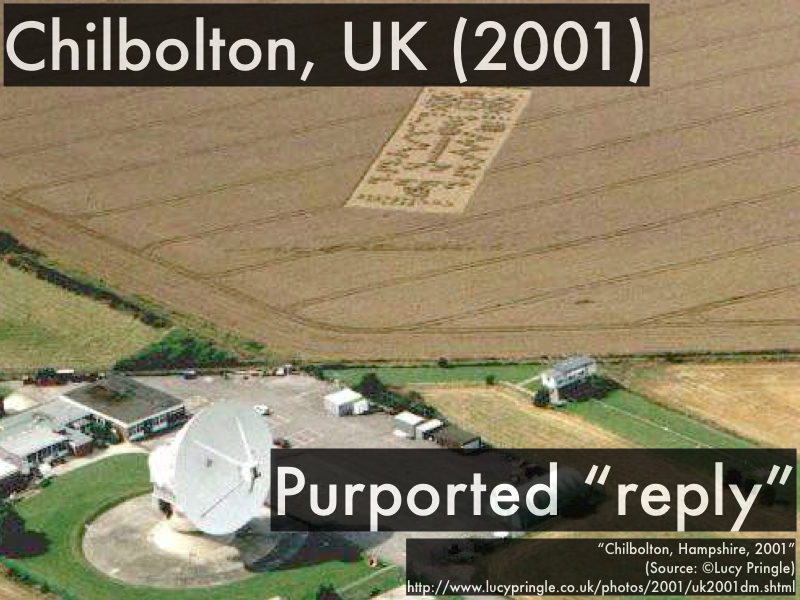 The truth is out there." "Massive stars, because they have a very short life span so they wouldn't be very likely for life to exist on a planet around them." "It would take about a billion years or so for life to develop elsewhere and massive star wouldn't live that long." "Because a massive star dies too quickly." "Massive stars would have the lowest chance of hosting life because they would offer the shortest window of time for life to form because of its shorter main sequence lifetime." "A low mass star would more than likely not be able to generate enough heat to create life on a terrestrial planet." "Medium-mass stars would most likely have a planet with complex lifeforms because they wouldn't die as quickly as massive stars, and not be as dim as low-mass stars." "I don't think any of the stars would have life." "Wouldn't all of them be unable to have complex forms of life? Since that would be my answer, and it is not even an option, I am wrong and confused lol." "A serious look at the possibility of life elsewhere in the Milky Way." "It is a equation used to figure out now many extraterrestrial intelligent civilizations are out there that we can communicate with in the Milky Way." "Don't do the homework at the last minute, and try to understand the material before coming to class. Do the problems and take good notes." "Honestly, to succeed in this course you need to participate. Come to class, learn as much as you can and don't worry so much about how you're doing in the class or what your exact grade is." "P-dog's class is helpful in that way because you have enough cushion to where you can actually try to learn the material and you can fail a quiz or two and learn from your mistakes for the midterm. Also, go to office hours if you don't get it, P-dog is pretty chill and no one is ever in there so you can just bombard him with physics questions and he'll show you how to start a fire with steel wool and a battery." "To succeed in this course, make sure you read, attend all of classes, and make sure your schedule is not too busy." "It is a good idea to stay on top of the homework and be sure to show up to class! They are very very helpful when it comes to anything that didn't make sense in the homework. Take both semesters with P-Dog! You won't regret it. He is awesome and truly wants you do to well and succeed in all ways possible!" "The practice problems and homework problems are the best way to learn the material." "If you read the presentations carefully before class, you will come in to the lecture with a fairly solid understanding of the concepts that are going to be presented. Anything that is not clear in the presentations should be able to be cleared up by the textbook, which is a great supplemental resource." "I found that going to the class tutor weekly really helped me! " "I would say you need to be pretty comfortable and disciplined enough to learn the material on your own through the online presentations. I know for myself personally reading something on my own isn't the best way that I learn. I'm more of a student that benefits from professors explaining the topic and going through practice problems. But it is nice to have the material ahead of lecture to prepare yourself for in-class working time." "Do all the homework and attend all class sessions and you should have a good start! " "You have to keep up with learning the equations and going over the in-class notes. It's really easy to get lost, especially since we have online presentations. Don't be afraid to bother the embedded tutor during their hours if you have questions!" "Make sure to do all of the homework and keep up with all the pre-/post-labs. 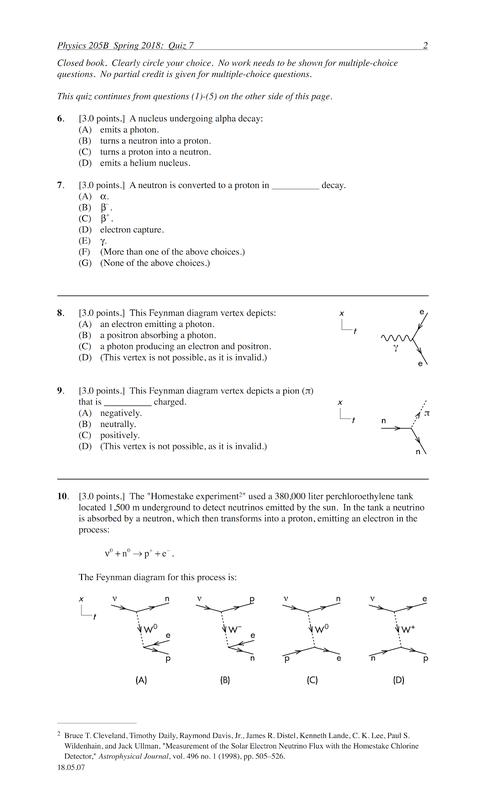 Do the practice problems that are posted before the quizzes and exams. " "As long as you make sure to study for the two midterms and do (most) of the homework there is no reason you shouldn't get an 'A' in this class." "Be consistent and diligent with the homework, and GO TO CLASS. Take as many notes as you can and review them. P-dog draws a lot of cartoons that make the material a lot easier to understand." "Creating my own notes prior to each lecture made everything much more helpful. In the lecture, you will go over problems and you can add these to your notes. Prior to every test, remake those notes with your more current knowledge on the subject and cues that P-dog likes to see in sample student answers. Reviewing the problems he puts on the blogs is extremely important. Not only do you see REAL exam and quiz questions, but you will also see past student answers, their grades, and a description of what each answer needed to be correct. P-daawwwwg can teach this stuff to a third-grader so don't be afraid to ask plenty of questions in class!" "Study the problems given in homework and class examples." "Do the homework and post-/pre-labs and everything should be fine." "Read the presentations before going to class! Even if it is super-confusing, it will be less confusing in class." "Do all the reading assignments and homework. Don't procrastinate. Ask questions!" "Take your time when studying the material before lecture if you can. It helps! If you still feel uncertain about things: doing the practice problems provided and making sure you include all the information required makes a huge difference." "Make sure you don't miss any lectures, that's where I got most of my clarification on confusing topics and where I learned how to complete midterm problems. If you understand the concepts the rest isn't too bad." "I think it depends of study style but for someone with a slow pace and/or with a different native language; read the blog and take notes, do all the exercises from the course website, take the worksheets seriously, ask the questions that you have to the professor and/or the tutor." Two separate circuits have an ideal 6.0 emf source connected to three resistors and an ammeter. 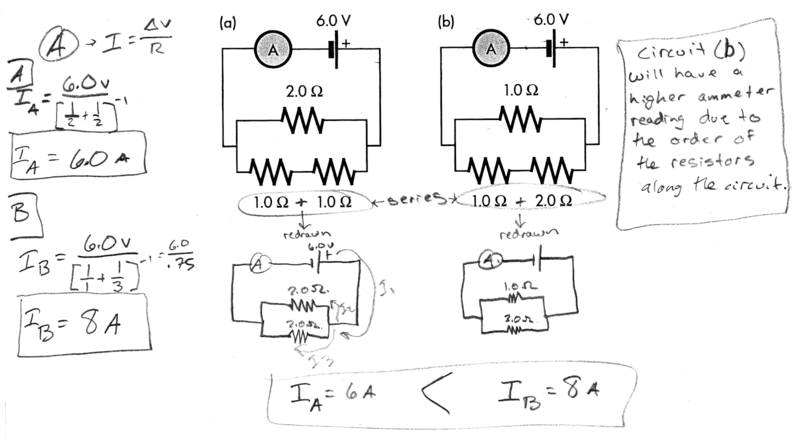 Discuss which circuit will have a higher ammeter reading (or if there is a tie), and why. 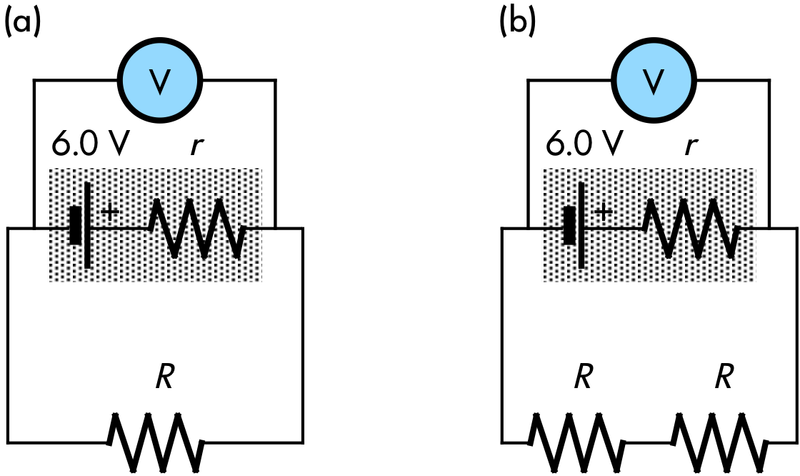 Explain your reasoning using Kirchhoff's rules, Ohm's law, and properties of ammeters. 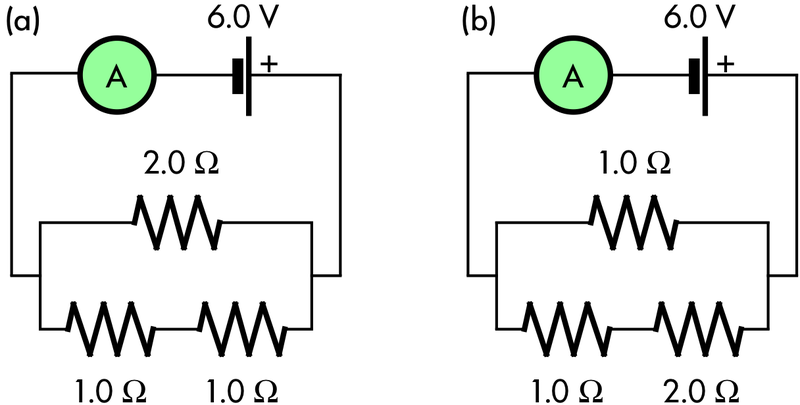 Ⓐ = Icircuit = ΔVeq/Req = (6.0 V)/(0.75 Ω) = 8.0 A.
correctly or nearly correctly determines equivalent resistances, but does not clearly carry result into Ohm's law to determine which circuit has more current. Limited relevant discussion of supporting evidence of at least some merit, but in an inconsistent or unclear manner. Some attempt at applying properties of Kirchhoff's rules, Ohm's law, and properties of ammeters. Implementation/application of ideas, but credit given for effort rather than merit. No clear attempt at systematically applying Kirchhoff's rules, Ohm's law, and properties of ammeters. A real battery with an emf of 6.0 V and internal resistance r is connected to a resistor R, and a voltmeter. An additional R resistor is then wired in series to this circuit. 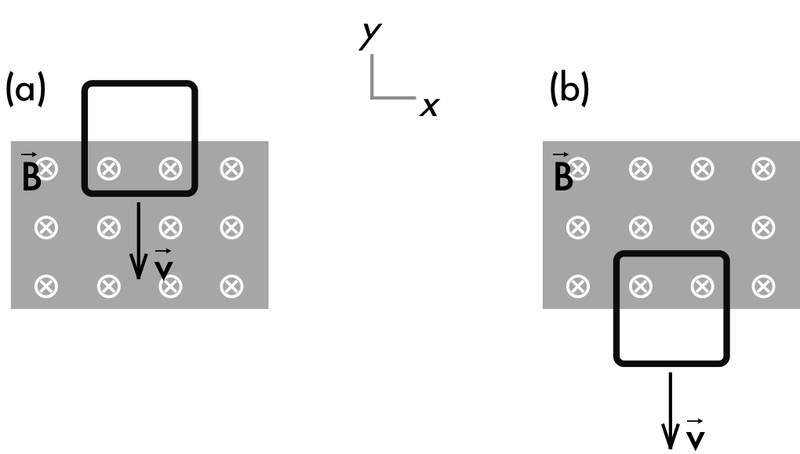 Discuss why the voltmeter will have a higher reading for the two-resistor circuit. (Assume that the internal resistance r of the battery remains constant.) Show your work and explain your reasoning using Kirchhoff's rules, Ohm's law, and properties of voltmeters. Ⓥ = (6.0 V)⋅(1 − (r/(r + 2⋅R))). As (p), but argument indirectly, weakly, or only by definition supports the statement to be proven, or has minor inconsistencies or loopholes. Two of points (1)-(3) complete and correct. Nearly correct, but argument has conceptual errors, or is incomplete. Has only one of (1)-(3) complete and correct. Limited relevant discussion of supporting evidence of at least some merit, but in an inconsistent or unclear manner. 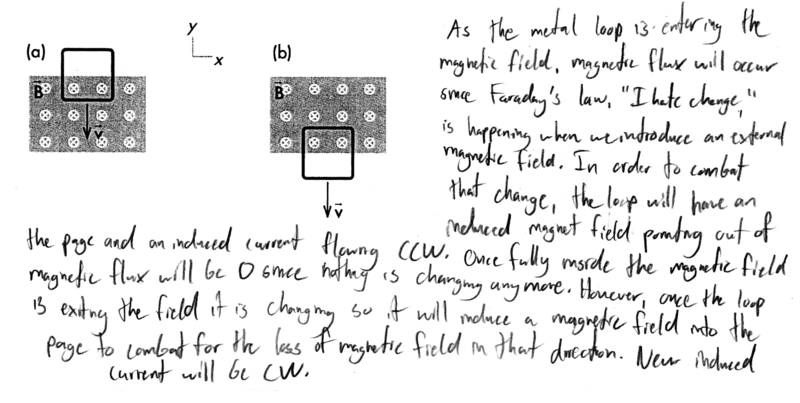 Some attempt at applying properties of Kirchhoff's rules, Ohm's law, and properties of voltmeters. Typically has current unchanged when additional R resistor is added, or argues that current increases, but Req = 2⋅R instead of r + 2⋅R for circuit (b). Implementation/application of ideas, but credit given for effort rather than merit. No clear attempt at systematically applying Kirchhoff's rules, Ohm's law, and properties of voltmeters.